River otters are semi-aquatic mammals, equally at home in rivers and on land. Relatives include badgers and weasels. Otters do not build dams as beavers do, but in some areas otters may build their dens within an abandoned beaver dam. Because the dam crosses the river, it is an ideal location for an otter den. River otter dens have underwater entrances. The entrance tunnel leads to a nest lined with natural material the otters find in the area, such as moss or leaves. Because the entrances are underwater, river otters build their dens in river banks. They also use found shelters, such as a hollow log or a shelter abandoned by another animal. Otters also select a location separate from their den to use as a latrine. They also have numerous smaller dens and resting places throughout their home range. According to the Environmental Protection Agency (EPA), North American River Otters live in 44 U.S. states and 11 Canadian provinces. Different types of river otters live in many other countries worldwide. Although associated with rivers, these otters also live in swamps, marshes and other wetlands. They are not particularly sensitive to hot or cold weather. Otters do not migrate seasonally, but they will move to a new location if their habitat becomes too polluted. The EPA reports otters are not particularly territorial, and do not defend a particular territorial area. 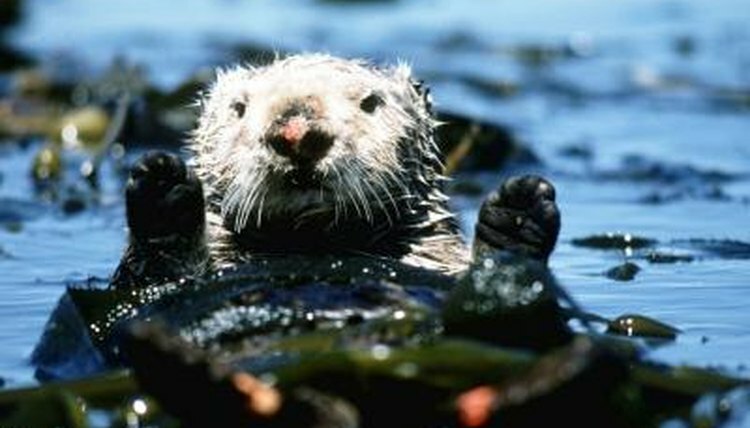 An otter will defend itself and the area immediately around it. An otter’s home range varies greatly from one square mile to 22 square miles. Male otters tend to have a larger home range than females. Age and social status also may influence the size of an otter’s home range. Environmental quality and food resources also seem to affect home range size. For example, if fish become sparse in one part of a river, the otters who live there would expand their territory to include portions of the river where fish were more plentiful. Male and female otters typically do not interact except during mating season. Young otters will remain with their mother for around a year, forming a family group. Unrelated otters also may form temporary associations and share resources. Otters are solitary creatures by nature, but fights between otters are rare and they tend to avoid unfamiliar otters. When temporary associations are formed, these groups do not always cooperate with hunting. Rather, they share the same home range and use hunting spots at different times. Does a Chimpanzee Hibernate or Migrate?